This is an extremely beautiful and moving story that I found in the book RETURN: Repentance and Confession, Return to God and to His Church, by Arch. Nektarios Antonopoulos, and published by Akritas Publications. It is originally from the New Anthology of St. Nikodemos the Hagiorite. We can clearly see that, though there is imminent danger to our souls if we remain unrepentant, Christ always receives back those who desire to return to Him. "St. Germanos of Constantinople, in one of his works on repentance, writes that a certain Christian who was overcome by the demon of fornication, fell into this sin every day, and every day confessed it again with tears, saying: 'Lord, have mercy on me and take this temptation from me, because I am overcome by sensual pleasure and there is no person in whose face I am capable of seeing your pure image and of taking joy in your most sweet countenance.' He went out of the church and again fell into sin. However he did not despair but, repentant, ran straight back to church. And this went on for many years - it must have been more than ten. And God, in his love for man, patiently awaited and sought his repentance." "'Damn and blast it! Why do you pursue me so, Jesus, Son of God? Your infinite compassion defeats me. Why do you accept back this impure fornicator who lies to you and spurns you every day? Why don't you reduce him to a cinder with a thunderbolt instead of showering forbearance and waiting for him to return? You are not just, therefore, but you judge unjustly and overlook man's sins whenever it suits you. As for me, you cast me down from heaven and didn't take pity on me at all, just because I showed a little pride. And yet, how is it that just because he howls before you, this liar and fornicator, you have compassion on him and heed him so you can show him mercy? Why are you called just then? For I see that you accept people and in your great love for them you overlook what is just.' And saying all this with much bitterness, he puffed out flames from his nostrils." "At once a voice from the holy altar was heard saying: 'You evil and destructive dragon, you who are not satisfied with swallowing up the whole world, but rush to seize this man also, who has fallen on my infinite mercy. Can you show me enough of his sins which would be equal to the blood I shed for the salvation of sinners? 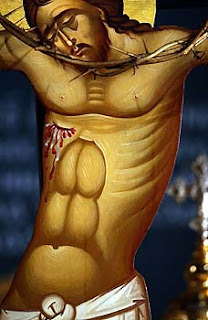 My sacrifice and death atoned for his sins. When he comes to you with his sins why do you receive him with glee, hoping to gain him, and not turn him away? And I, who am merciful and good, and commanded my apostle Peter to forgive his brother seventy times seven a day, or four hundred and ninety times, that is without measure, why should I not forgive him? Yes, I will forgive him and because he hastens to me I will not turn him away until I have won him; because I was crucified for the sake of sinners and I laid out my hands on the cross in order that whoever desires to be saved might find refuge in me. In my kindness I do not turn anyone away, even if that person comes to me countless times a day and then leaves me again; for I came into the world not to call the righteous but sinners to repentence.'" "And all the while the devil stood trembling, unable to move from the spot. Then the voice was heard again saying: 'Listen, you deceiver and enemy of truth, as to what you accuse me of: since I am indeed just, as I find man so shall I judge him. And since this man humbles himself before me in repentance, confessing his sins and pleading for mercy, I will take his soul now and I will give him a crown like that of a saint; for he endured for so many years trusting in my goodness and did not despair of his salvation. As for you, O tormentor, see how much honour his soul will be granted.'" "And then the brother, prostrate on the floor of the church before the icon of Christ the Saviour and lamenting and wailing, gave up his spirit. And immediately a company of angels appeared and took up his soul with much glory and rejoicing and brought it to a place of rest. Then the wrath of God fell upon Satan like a tongue of flame." Thanks a lot for the inspiring story, the mercy of God is trully unlimited. But we should also never take God's mercy and grace for granted.